Having been laid-up at Auckland since 1936, Monowai was requisitioned for war service with the New Zealand Navy on 19 October 1939. Converted to an Armed Merchant Cruiser the ship served in the South Pacific until 1943 when it was decided that it would be better employed as a landing ship. Recently a handsome carving from the Armed Merchant Cruiser HMNZS Monowai was donated from the same ship, which highlights the varied history of this ship. The carving is of teak and features a badge in one quarter of which is an Indian elephant, another depicts Britannia, a third has a Chinese pagoda and the fourth shows pyramids and a camel. Below the badge is a banner with the word Razmak. Together these remind us that prior to becoming a vessel of the Union Steam Ship Company; Monowai had been built for the Peninsular and Orient Steam Navigation Company and entered that company’s service as SS Razmak. Built by Harland and Wolf at Greenock and launched on 16 October 1924, Razmak was handed over to its owners on 26 February 1925. The ship departed London on its maiden voyage to Aden on 13 March. Thereafter it provided a feeder service for the company between Aden and Bombay, every two weeks, with a carrying capacity of 142 First Class and 142 Second Class passengers. However, the service was not popular because other companies had begun direct services to India from European ports, rather than transhipping the passengers at Aden. P&O joined this trend by routing its liners to Australia via Bombay and as a stop-gap measure, placed Razmak on a new service from Marseilles to Bombay, because the ship was too small for the usual P&O services. In 1929 the service to Bombay was abandoned and the ship was laid-up. Fate then intervened by way of a disaster in the South Pacific. The Union Steam Ship Company ship Tahiti was enroute from Wellington to San Francisco on 15 August 1930, when the starboard tail shaft broke, puncturing the hull and the ship sank south of Rarotonga two days later. As a replacement the Union Company purchased Razmak, modifying it in Britain to increase the passenger capacity to 208 in First Class and 203 in Second Class. Renamed Monowai the ship sailed to Sydney, leaving that port on its first Pacific voyage on 27 November 1930. All did not go well, however, as Monowai’s introduction on the San Francisco route coincided with a recession and the ship could not be kept on that run all year. In May 1931 it replaced a ship of the Canadian-Australasian Line on the Sydney to Vancouver service, while one of that line’s ships was being refitted. After this Monowai was employed on the Trans-Tasman route until September, when the ship returned to the San Francisco run. At this time, though, the Matson line, with a heavy US Government subsidy, introduced two new ships, Mariposa and Monterey, on this service and the Union Company found itself unable to compete. Monowai left San Francisco for the last time on 26 October 1932 and was then employed on the Trans-Tasman route, with the occasional relief voyage to Vancouver. Having been laid-up at Auckland since 1936, Monowai was requisitioned for war service with the New Zealand Navy on 19 October 1939. The relevant legislation was the Public Safety Conservation Act 1932: Shipping Control Emergency Regulations. She was officially chartered on 21 October 1939 at a cost of £5000/month. 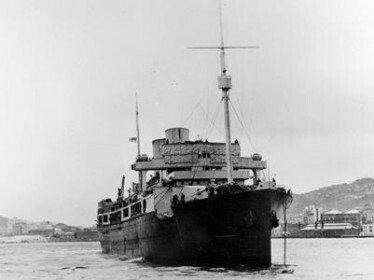 She was formally renamed as Monowai on 30 August 1940. If she was lost on war service, the government would be obliged to pay the company £416,000. Converted to an Armed Merchant Cruiser the ship served in the South Pacific until 1943 when it was decided that it would be better employed as a landing ship. Monowai was paid off from the Royal New Zealand Navy in Britain in June 1943 and after conversion, commissioned into the Royal Navy. It participated in the D-Day landings and between November 1944 and March 1945 carried 43,000 troops between Southampton and Le Havre. During 1945 the ship made three voyages repatriating Russian prisoners of war, from Marseilles to Odessa, before proceeding to the East. After being dry docked in Calcutta in early 1946 Monowai then made two voyages repatriating Australian soldiers. The ship was released from naval service in September 1946 and commenced refitting for return to merchant service. Strikes intervened and it was not until January 1949 that Monowai commenced trials off Sydney. With a capacity of 181 First Class and 205 Tourist Class passengers the ship was then employed on the Trans-Tasman service, departing Sydney for the last time on 27 May 1960. On 2 June the ship undertook a cruise of the Pacific Islands and after disembarking the passengers in Auckland following this cruise, Monowai steamed to Hong Kong for breaking up in September.